Never played at City Bingo ? You're missing out! City the Cat is one of bingo land's most generous patrons and at the moment he's even giving away to every player on sign up! The sights at City are of course more than just eye-catching niceties, this cool cat has got his version of the game set to maximum bonus is bound to set you in a tail spin too! As the 'world's brightest new free bingo site where you can play all day and night winning cash along the way', City Bingo has plenty to offer players even after these brilliant welcome packages such as his five free bingo rooms! With City's focus on set on bargain bingo across the site we've no doubt that once you've stopped by you'll want to move into this City permanently. It is after all bedecked with bingo halls hosting both 75 and 90-ball games for your gaming pleasure and even offers daily rewards for reloads so that if you're willing to pay for your play you will get a thank you from our favourite cat every time. Giving you back on all monies you deposit, City will also then invite you to his Daily Deposit Reload Freebie game so you can get in the running for his bonus guaranteed hourly jackpot! These games run from 11am to 11pm, so if you get up and running early you could play all day with City. You might not expect a free bingo site like City Bingo to host it's own VIP membership scheme, but since City has so far proved himself to be exceptional in most respects, we're happy to say he continues that trend by hosting a VIP scheme that beats most. We've already pointed out which most sites no longer run to but as a VIP player there are yet more huge extras you can run to such as exclusive jackpot games and guaranteed games you'll get access to. Work your way up the levels with City's VIP scheme and you could get extra free games and a birthday bonus to name but a few benefits. We're surprised City thinks it's necessary to offer players more than bingo for free 24/7, but we have to say we're very happy that he does – in fact we think his overall package is nearly purrrfect! 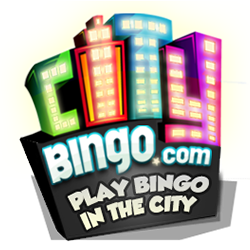 Bingo isn't City's only forte you'll be amazed to hear roomies, he's recently set up Instant tourneys too for those of us who love to get a bit more out of our bingo site. City's Friday Instant Tourneys take on board his top brand name games such as Cleopatra, Fluffy Favourites and Sugar Train, so there's something for everyone. Most of us love a quick spin while we're onsite let's face it, so why not let City help you to make you play pay with a quick turn on one of these tourneys? All you have to do is win as much as possible in the allotted time and sit back to hear what your prize is! We love a good tourney and with each of these running for the day, the adrenaline kicks in and the fast pace of the game really gets players going and chat buzzing. We're always on the look out for the latest City tourney and given that the top ten players in each game gets a prize we hope to see you in the game too! As if all this wasn't enough, you'll be amazed to hear that City also hosts guaranteed pots in his paid game every day. Times and prizes vary so it's worth checking before you start play but with some paid pots like his monthly Main Attraction FREE game at 8pm reaching you really should make a date with this debonair host. In summary, City really does have it all. From free games with huge pots to daily bonuses and free play this is clearly a site built by bingo players for bingo players. All that's left to say is we truly do love to 'wake up in this City that never sleeps' and we think you will too!